TV Thickness Must Be Within 2 Inch (5CM). Home TV Cover: use for flat and flexural screen LED/LCD television, apply to TV specification 32-65 inches. Note: this cloth cover is design for thin LED/LCD TV, so the TV thickness must be within 2inch (5cm). Material: made of high density silk fabric cloth, soft & smooth, not damage big screen at all, very practical to protect your tv screen. 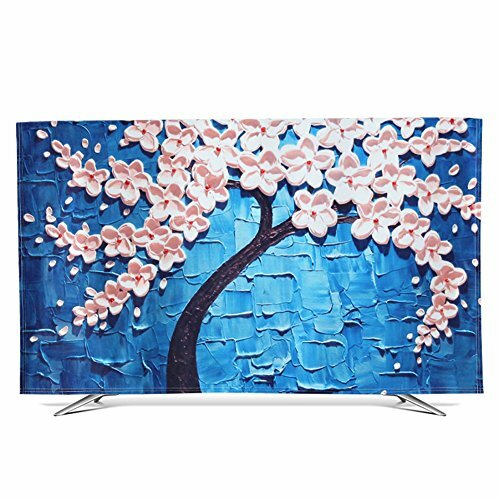 Features: dust-proof, water-resistant, sun protection, stain-resistant, environment friendly, easy to wash.
Protector & Decoration: not only television cover cloth, beautiful printed design, you are going to love it's cute patterns and bright color, like a painting decoration your home. We accept 30 days free returns, if you don't like our product, send it back you can get full refund, 100% make you satisfied. If you have any questions about this product by XIMIXILYQ, contact us by completing and submitting the form below. If you are looking for a specif part number, please include it with your message.